Really? Can we do it? Or shall we do it? Don't get me wrong. I have nothing against green technology; in fact I'm all for energy saving. I advocate renewable energy. 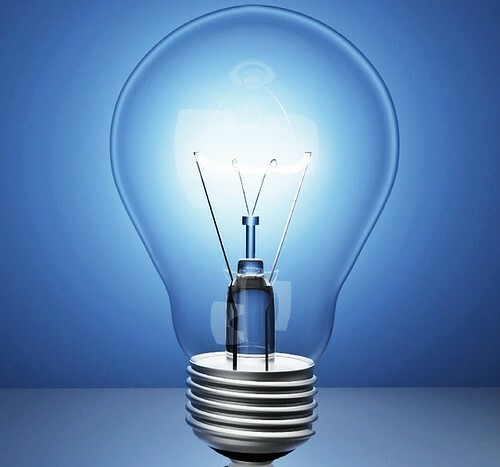 Incandescent light bulbs are electric lamps that produce light with a filament wire heated to a high temperature by electric current passing through it. The heated filament glows at high temperature and gives out light. There is a lot of energy dissipated during the heating process making incandescent light very inefficient. The following report from The Sun suggest that banning the product is the best option to reduce CO2 emission. But the 2-year timeframe is too short if you ask me. Cost of the more energy-efficient CFL and T5 lamps are more than 10 times of incandescent. You can buy CFL for as low as RM16.00 to as high as RM50.00 a piece depending on brand while incandescent lamp can be bought at RM1.50 to RM2.00. LED lamps would be even more expensive. The majority of us will not be able to afford it to be honest. CFL and LED have very low power factor (pf). In contrast filament bulb has unity pf. When the ban is fully enforced and millions of people are forced to use LED lamps, you can imagine the power utilities headache with severe pf issues. Furthermore, the energy saving lamp tubes are filled with mercury. Technology will improve over time where pf and mercury issues would have been taken cared of. But the banning should also be timed in tandem with technological advancement. I'd say, 4 to 6 years is more appropriate instead of 2014 as cut off date. Don't commit ourself hastily to manufacturers lobbying for early adoption. There could be something up their sleeves. PETALING JAYA (Oct 16, 2012): The Energy, Green Technology and Water Ministry has announced phasing out traditional light bulbs – also known as incandescent bulbs, that will eventually lead to a complete ban in 2014. The policy is part of the government's initiative to reduce carbon intensity by 40% by 2020, and to enable consumers to use energy efficiently by using energy-saving lights such as the compact fluorescent lights (CFL), T5 tube lights and light emitting diode (LED) lights. The implementation of the policy is being done in two phases, with the first phase in 2011, seeing a ban on the sale and import of 100-watt incandescent light bulbs. The second phase is currently being carried out from Jan 1 this year until Dec 31 next year where the government will ban the manufacture, import and sale of the 100-watt lights. This will save consumers about RM336 million a year if they buy energy-saving lights as incandescent bulbs are less energy efficient and are not as environmentally friendly. Other countries have also initiated similar policies, with China banning imports and sales of certain incandescent light bulbs starting this month, and gradually extending the ban to those over 15-watt in Oct 2016. Anticipating huge global demand for LEDs, the Department of Standards Malaysia will help local companies adopt international standards and speed up the industry's adoption of Malaysian Standard (MS) to ensure production of high quality LEDs for export and domestic use. A total of 12 MS have been published so far, covering safety, testing and performance of LEDs. These international standards were adopted from the International Electrotechnical Commission, where compliance to MS will increase local manufacturers' access to international markets. International certification within Malaysia is also available, with the first LED-SSL certification centre outside of the US was set up in Penang in 2011 to perform testing in accordance with the standards of the American National Standards Institute. Energy saving topic!!! It’s nice to see each Federal is honestly applying its pressure to think the best soon. The tale elaborated some technical features in the areas of light output, optical precision, lifespan, power consumption and other characteristics where the giants have remained the same. The technical products have been drastically changing every second as technology with power efficient sources is born.